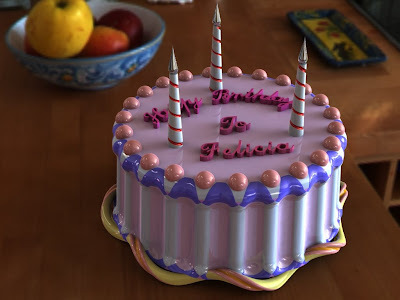 Hi all, today is the birthday of one of our sweet blogger-> Ms. Felicia. To show my appreciation to the effort that she has put on SolidWorks M'sia Community,i have tried to use SolidWorks to bake a birthday cake for her! Draw a circle and draft it when you extrude. The side slope can be created by using revolve cut with fillet and do a circular pattern with suitable number of instances. Insert a sketch on the top face of the cake, use text function to create the wording. Becareful! The wording style that you have selected might not suitable for extrusion if they are overlapping with each other(Just like the font style that i have selected for this cake).In this case, you just need to right click on the text-->select Dissolve Sketch Text, then you will able to use the Trim Entities function to trim off the extra lines and eliminate overlapping between text. Create the candles.The helix cut of the cancle can be created by using a sweep cut. Since the candle is drafted, the path of the sweep cut can be created by using Helix/spiral-->variable pitch option. Step5: Assign creamy color to your cake base on your preference! I am so impressed with the 3D cake, bravo Charlie & Nelson... your 3D model indeed inspires me - not on SolidWorks rendering that i can do (you all know I am not a CAD user... but i really wish i can decorate a real cake as nice as the model >_< hopefully, this wish will come true one day. Keep up the good work!